About a month ago I found a little piece of driftwood on the beach that looked very much like the hull of a boat! I posted this photo on my Instagram account and it was a really popular photo! Proof that you really don’t need elaborate or complicated creations to inspire people and inject a little creativity…simple is so often best! Some people have asked me for the pattern of the sail so they too can create a coastal inspired decoration. This pattern is for a simple right angled triangle which I have used as a simple sail to add to boat shaped pieces of driftwood for a very simple yet very effective coastal inspired decoration! 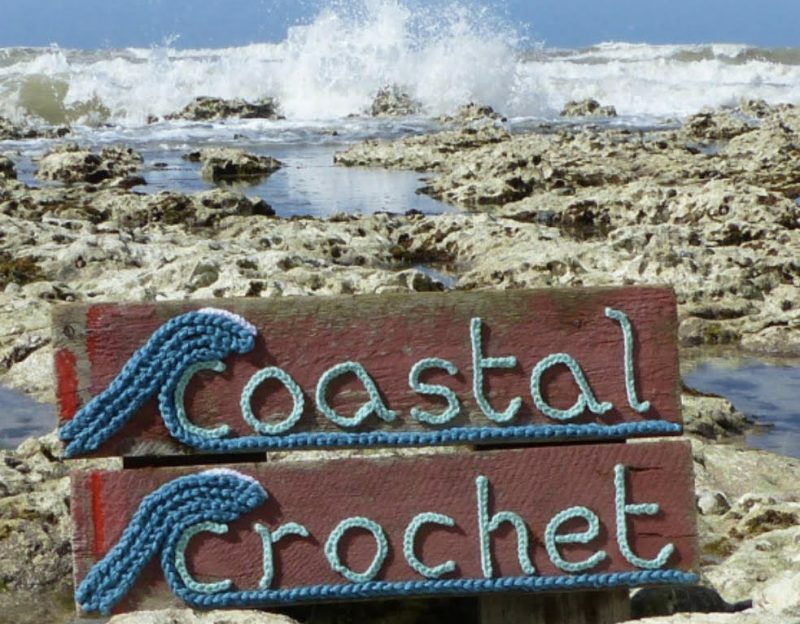 Materials: Any yarn with appropriately sized hook (for the sea green sail I used an acrylic DK yarn with a 3.50mm hook, for the orange sail I used Rico Essentials Crochet cotton thread and a 1.75mm hook), scissors and yarn needle. To make the sail boat you will also need a piece of driftwood, a small stick and some super glue. Abbreviations: ch: chain, mm: millimetres, st(s): stitch(es), tch: turning chain, tr: treble. Pattern Notes: The triangle is crocheted in treble (US double) crochet stitches – UK crochet terminology is used. It is crocheted from the point of the triangle and increases are made every row on one side only. The triangle can therefore be made as wide as needed – just continue increasing as indicated until the desired length and width is reached. The turning chains count as a stitch. Repeat Rows 4 and 5 until 9 rows have been worked. Of course you can make less rows if you want a smaller triangle or continue repeating rows 4 and 5 until desired length and width is reached. To make the sail boat I found a very thin stick from the garden for the mast. I put the sail onto this mast as shown in the photos and then made a tiny hole using a nail or screw in the driftwood where I wanted the mast to go into. I put a small amount of glue into this hole and inserted the mast holding it in position until the glue dried. And there you have it…a little driftwood sailing boat complete with crocheted sail! The search is part of the fun! Though I don’t live near a beach… I’ll have to wait till my next holiday by the sea! It’s like that with the search for sea glass too. I guess it wouldn’t be so satisfying if it was too easy! Ah great! I have been wanting to do this since I saw your last post. Thanks for pattern! These are cute, thanks for sharing. Aww I bet they look fab on your walll, very creative! Love these, they’re so cute! So cute! Sometimes simple is best.